My heart is incredibly sad tonight for a family I have never met. One day, towards the end of November I walked down into our basement where Scott was working in his home office. I had a mundane question about the house or schedules or something of the sort. When he turned around to look at me he looked completely crushed and utterly despondent. "Babe, what's wrong?!" I asked, quite concerned. It's very rare that I see that much sadness, on the brink of tears, in his eyes. He went on to tell me about the news one of his colleagues had just shared with him. Their 4 month old little boy, Landon, had been diagnosed over Thanksgiving week with an incredibly rare, progressive, degenerative muscle condition. Most of the children diagnosed never see their first birthday. Oh God. Dear God. Why do such things happen? My heart aches even as I write this. As Scott shared the news with me the tears were unavoidable. How could we, a husband and wife with three beautiful girls, one just eight months old, not feel deeply and personally the despair and utterly tragic nature of such a diagnosis? It seemed so unfair. It seemed like the absolute saddest thing on earth we could even possible imagine. We did not even want to imagine it and yet, for Scott's colleague, it was the new reality he was facing. We wanted to help, knowing there was nothing we could do. We wanted to stomp our feet and shake our fists at the injustice of it all. We simultaneously wanted to ask God for healing and ask him why and ask him to make everything right, even though, despite our very deep faith, we realized the direction the whole thing was heading. And, when you come to the realization that life can be that tragic, you're actually not sure what to say to God. What to ask. How to pray. You continue to trust in a sovereign God who oversees all, yet your trust becomes complicated and layered and complex. You realize how broken the world truly is...and you're not sure what to do with that. One of my very favorite Christmas cards this year was sent from this particular colleague and his wife. It was a beautiful picture of their dear sweet boy. He was wearing a brown knitted winter hat that looked like a bear. His face was perfectly sweet. He looked completely healthy in the picture, even though I knew he was not. It was a photograph taken of him laying on a blanket with Christmas ornaments around him. It was beautiful and it touched me deeply and made my heart wretch when I hung it up. I would look at that card almost everyday and in the midst of the busyness of Christmas I would remember to say prayers for that little boy. Every time I saw his face I would be reminded, starkly and almost viciously, how lucky and blessed we are to have children who are healthy. Why us? Why them? Why? Why? Why? Thank you God. Thank you for my girls' health. Please God, please. Heal that little boy. Don't make them go through this. When I finally took our Christmas cards down I stacked them in a pile and placed them on our counter. I put their card on top as a reminder to keep praying for Landon...It was several weeks before I finally tucked the cards away with our other Christmas pictures from the year, though that sweet face is imprinted forever in my mind. And then, tonight, while I was sitting in Panera trying to write a few words about life and kids and family, Scott forwarded me an email from his colleague that said what we were hoping he would never have to say...that their sweet son had passed away. Six months old. It makes absolutely no sense. When you hear news like that it breaks your heart. Into pieces and pieces and pieces. When you hear news like that your silly, minuscule anxieties and challenges and frustrations about life and messes and kids suddenly seem incredibly trivial. So tonight, with a broken heart, I say a prayer for sweet Landon and his family. Please Lord, Please. Surround them with angels. Comfort them. Uphold them. Send help and lots of love to them. Be with them every moment. There are many things we will never understand in this lifetime, but we know that you send healing to the brokenhearted and I pray that you would do that in these weeks and months to come. If you are reading this, please say a prayer for Landon and for his parents...May the peace that passes all understanding be with them. If you are reading this and have healthy children at home, remember to be thankful for that too...It's a blessing that we often take for granted, and one that tonight, I'm completely humbled by and grateful for. School is closed...again. 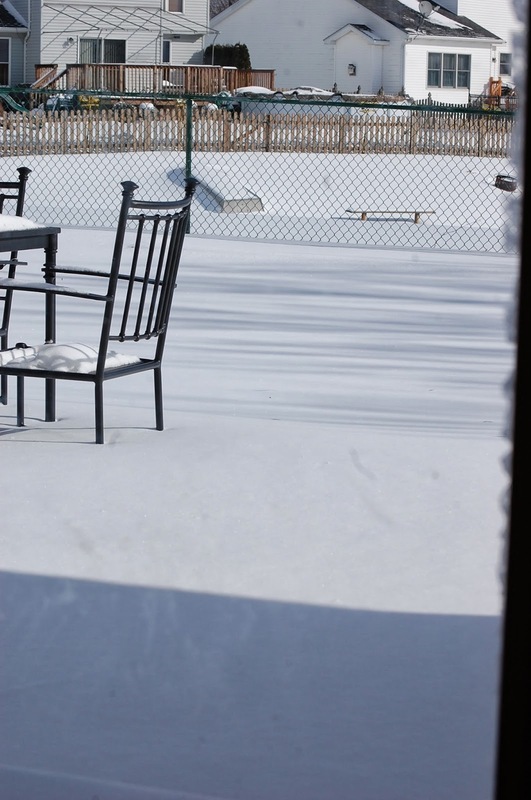 It's our fifth snow day this year (we were off yesterday too). And While Ava is excited for the immediate mini vacation, I'm pretty sure the snow days now need to be made up at the end of the year which is going to be a bit of a bummer when that comes around...in Ava's words, "Why should we have to make the days up? It's not our fault!" I kind of agree babe. But school is school and there are rules...and so sadly, the poor kiddos will be writing their ABC's when the sun is finally shining in Buffalo. Seems kind of unfair in my book too, but what can you do? For me, I feel like I'm writing from a cave in the frozen tundra of Antarctica. When you have three kids to bundle up, in addition to yourself, it's really easier to just stay inside. And probably safer. So we do. And quite frankly, what could be a more fitting soundtrack to our current days at home? Frozen songs in the frozen tundra. Perfect! We spent part of yesterday morning making new bracelets on the Rainbow Loom (for those of you who don't know (which probably means you don't have kids!) the rubber band looms are the new craze in bracelet making for the school kids). Ava tried a more complicated pattern and Ella made a simple fishtail which she has been wearing around the house with great pride. They're at it again this morning with the new rubber bands I picked up last night! Ava's book and the case we picked up for her rubber bands. 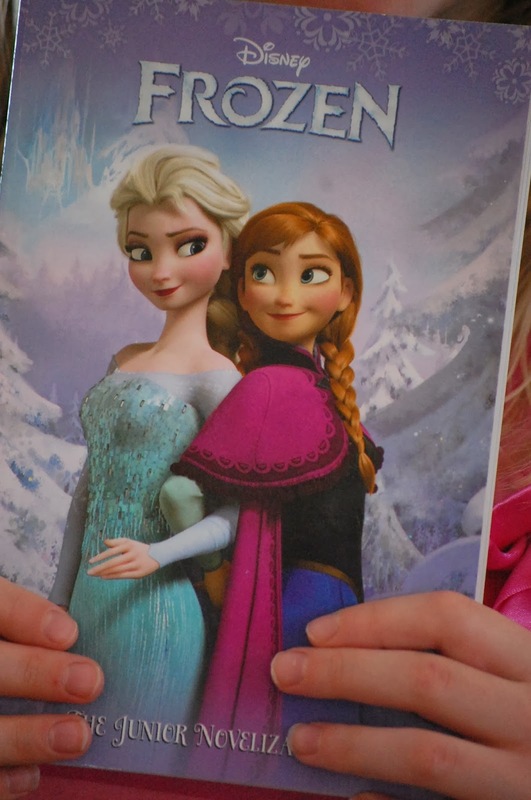 Ella's read along Frozen book. The girls sat on the couch and read together...so cute! Ava's book that I've been reading with her. I had to add this. Aubrey's INCREDIBLY cute thighs. 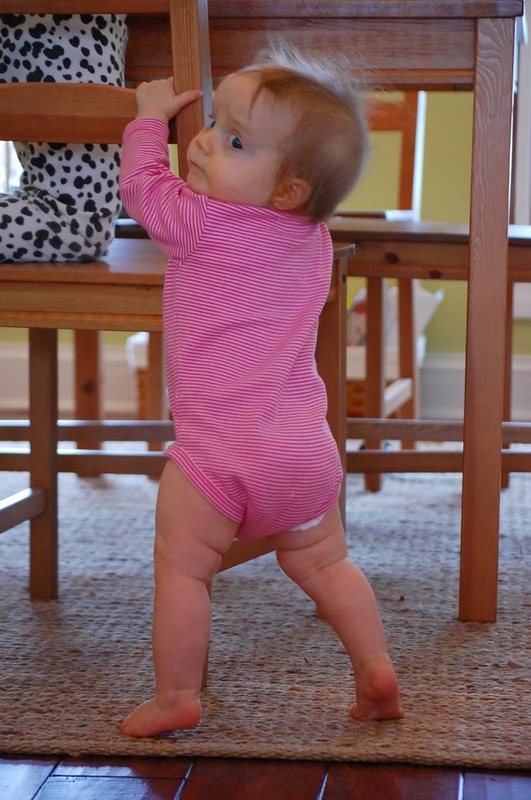 Aubrey has made it to the very confident and mobile crawling stage and is starting to get into everything. EVERYTHING. The DVD cabinet, the girls toys, the garbage can, the dishwasher, drawers, cabinets, laundry baskets...you name it. If it is not an age appropriate toy, she's interested. If it is an age appropriate toy, it mostly gets left sitting untouched in her wake. You know, a house full of plastic toys and all they want is the box of pampers wipes or a piece of cardboard. She's still gumming food with her two bottom teeth (which is nothing less than adorable) and likes to babble with long strings of "ma, ma, ma. ba, ba, ba. da, da, da." Sometimes she goes on about "Bob" too..."Bob, bob, bob, bob" with her chubby cheeks. The girls have taken a note from Scott's book and like to ask her who and where Bob is. "Aubrey! Bob's not here you silly girl," Ava will say. "Whose Bob?" The house is pretty much trashed at the end of most days. I like to say it looks like we had a frat party at the end of every day and Scott and I get to be the clean up crew, minus the beer bottles which have been replaced by Avent plastic bottles filled with water for the baby at meal time. 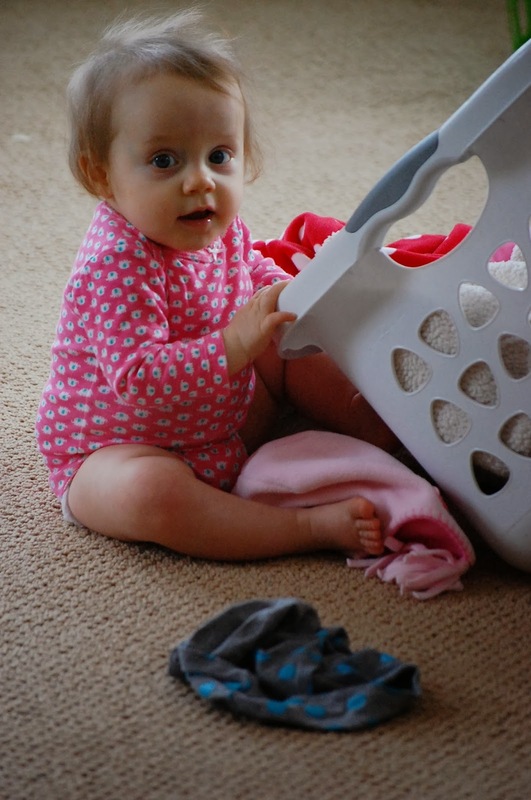 Between Aubrey's insistence on pulling out everything she can find and dumping every basket she comes across, and the girls incredibly creative imaginations and play times, we're starting to accept that it is simply the new landscape of our life. A little messier than one I would have painted, but I'm pretty sure that's an excellent metaphor for life in general, right? There was so much stuff scattered around the living room and kitchen table the other day that Scott thought he would be funny and make a point of it all. He started taking random items, a box of granola, a paper towel, his hat, and threw them willy nilly on the floor. "Look, let's just throw this here. Why pick it up? And this, let's throw this over there," he says as he launches the paper towel over his shoulder. "I'm not going to pick up at ALL tonight. Not a thing. And neither is mom!" The girls looked on with mixed alarm and amusement. Probably a very justified reaction. "Dad, you guys aren't going to pick ANYTHING up? But...but...but...You have to. You're the parents!" It must have made an impact. Within a half hour Ava started putting blankets away and picked the box of cereal up off the floor. As a matter of fact this morning she told me that she cleaned up the entire living room while I was out last night. AND thanked us the following morning when, in fact, the downstairs was picked up and she was thankful to be able to make it to the breakfast table without tripping on a shoe. Reverse psychology. I guess it really works! And while I've been brewing on some posts on more significant subject matter than snow days and Disney movies, life with three girlies has been marching on so fast that not a whole lot is getting written...Or, when I sit down to actually write, my brain seems currently incapable of deeper thoughts. 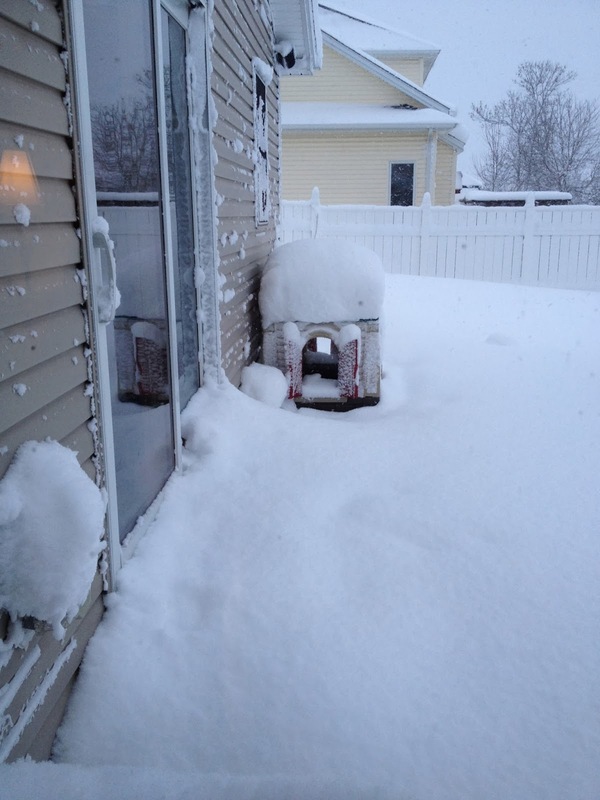 Here's my take-- the current snow is deep enough, we don't need anything else deep right now, right. So...we'll save the deep thoughts for a sunnier day. And if you're one of my friends living down South...feel free to start sending real estate listings. I'm ready!! It's chilly willy over here, but at least the sun is peeking through just a wee bit today! 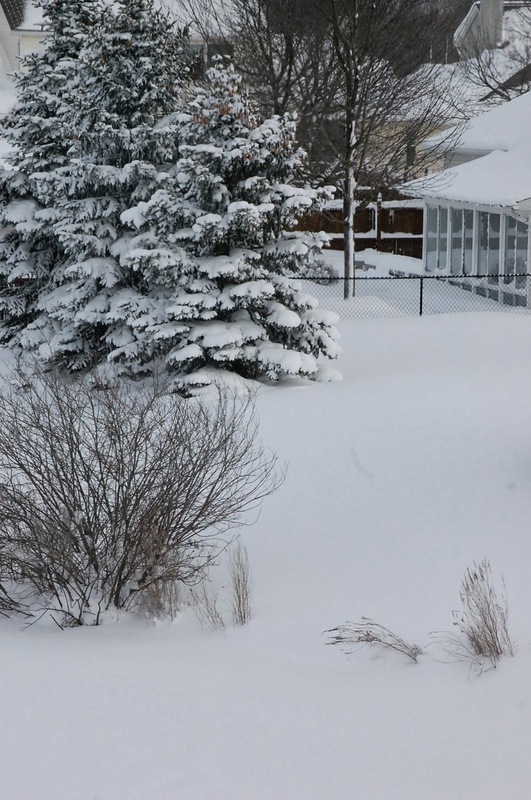 If you've never visited or lived in Buffalo I'm here to tell you that it is not really the amount of snow that we get that makes our winters so tough...not for me anyways. It's the gray clouds that settle in and hover over our city for m-o-n-t-h-s on end. I swear you begin to feel as if the sun has gone on permanent vacation to Florida with all of the retirees and sun bathers, never to return. Friends and relatives will post photos on Facebook of beaches, and short sleeved t-shirts, and status updates about runs in the sun and I find myself thinking, Where are they? Mars? The sun doesn't shine on earth this time of year. Yes, I will confess, I have joined the throngs of cold Buffalonians vowing to move south one of these years. I'd like to be the type of gal that bucks up, holds strong and faces the adversity...er...cold weather...with grace, but I can't lie. It gets me every year. Anyhoo...I'm doing my best to be in the moments. The very cold moments. I think I end up writing at least one blog post every year about the cold and then I just get on with it (: I do find it quite beautiful to watch snowflakes float softly and steadily from the sky. And to see porch lights reflect on glistening beds of snow in our neighbor's front yards. There is something to be said for getting out to a ski hill and feeling the breeze on your face and watching your children glide down with smiles on theirs. Beauty can be found in the cold, snowy days. And if winter does one thing well it fills one with excitement and anticipation for warmer spring days. It makes the buds on the trees and the bulbs that finally peek through the ground all the more thrilling when they finally make their appearance. In the meantime, I'm still settling my thoughts and intentions on some goals for this year. Intentions which include praying more, writing more consistently (even if it means simply journaling more regularly), teaching the girls about prayer, and, of course, trying to become more organized in some capacity (organization for me seems to be that elusive goal that I set every year that I make bits of progress in, but never quite feel like I've "arrived" in the place I'd like to be. Some people are back on the treadmills every January. I'm always digging out my organization books!). 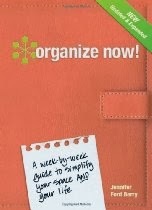 practical book that breaks down parts of your life and home into weekly goals/action steps...56 of them to be exact, so that you can work on one component each week. The major headings are Organize Yourself, Your Papers, Your Things, Your High-Traffic Areas, Your Personal Spaces, Your Storage Areas, Your Special Events and Your Routines. You can click on the title above to read more about it on Amazon. In the vein of goal setting and working towards consistency in some areas of my life I have decided that this year I will commit to a new blog post every Tuesday. While I'd like to be posting more than once a week, I find that it is not often practical to do so during this season of life. I'm committing to Tuesdays because it offers me some consistency/accountability and allows those of you who are reading to know what to expect! Good for everyone, right? So, until next Tuesday... 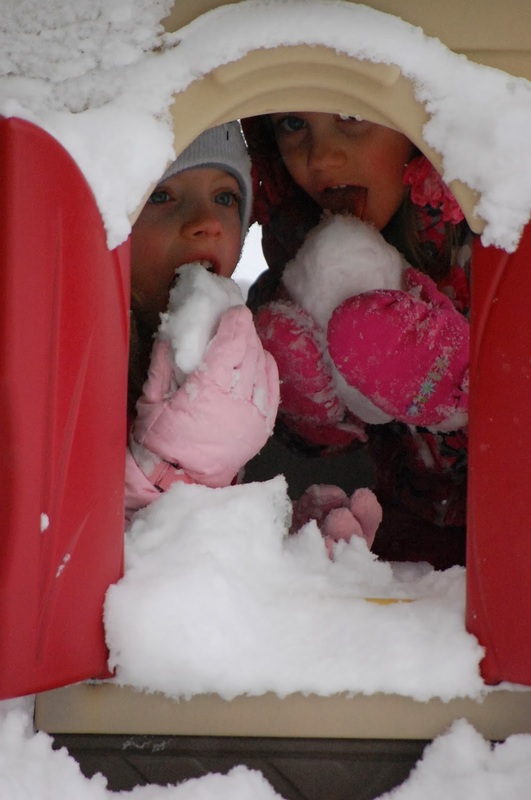 I hope you are finding ways to enjoy your cold, snowy days. I'm working on a series of posts about teaching children Biblical principles like prayer and worship and praise. This is not an area we always do right over here, but it is an area of life that we are always trying to do as well as possible and are always looking to improve in where we can. I'll share with you what we do, how we keep it practical and why we think it's worthwhile and incredibly imporant! Ahhh, snow days. Wonderfully exciting, busy, messy, exhausting snow days. We had two of them this week. That's right! 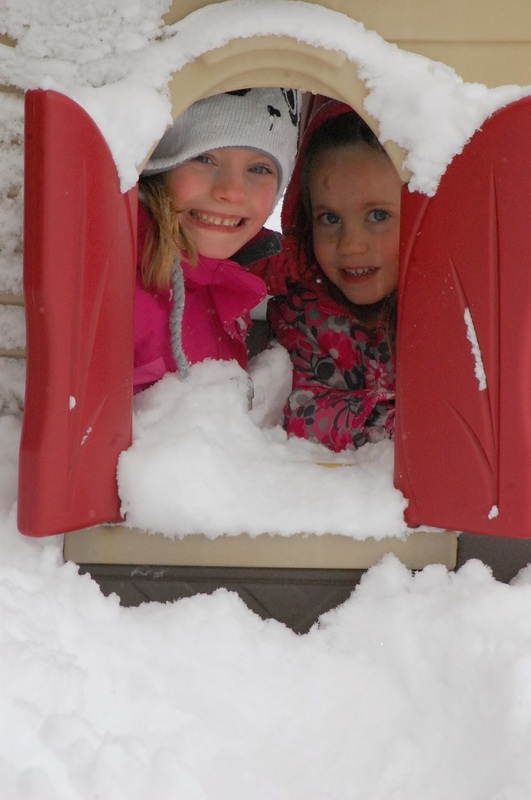 When you are six and four years old, what could be better than just one snow day the week after Christmas break? Two snow days. In a row! Even though Ella only missed one day of school she was super excited to have Ava home for two (she misses her playmate while she is in school all day). 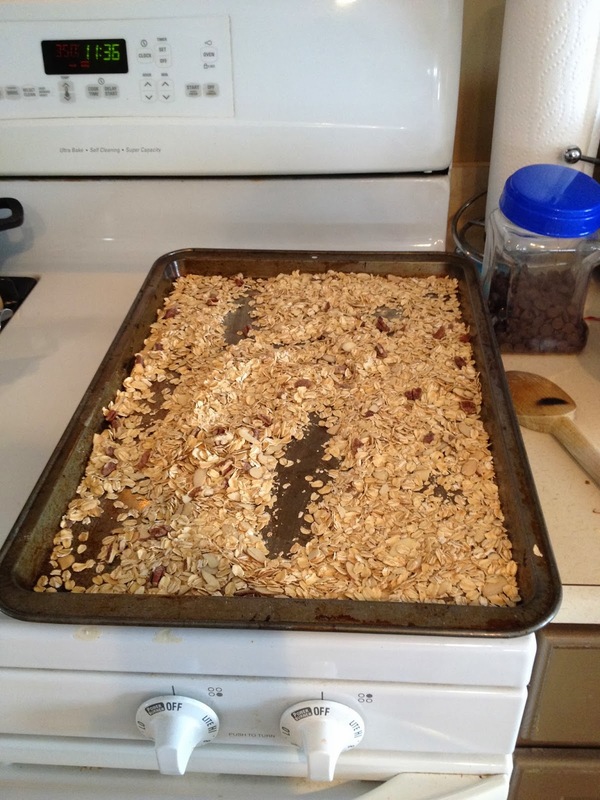 We made granola, and colored pictures. The girls dressed up in dress up clothes and danced around the living room. We bundled up both days. The first day we went for a very short drive around the block, which functioned as a fun excursion and proof that the girls really couldn't play outside (they had asked many times that morning to go sledding! 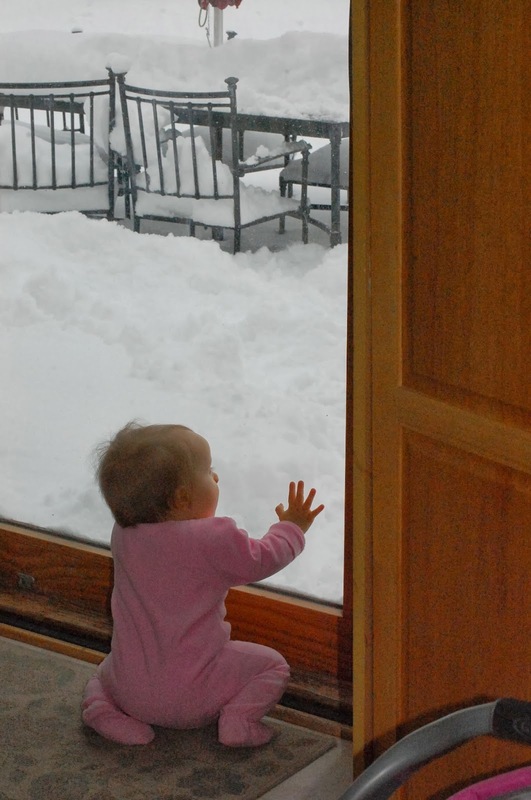 I took on the annoying mom role and kept asking Ava whether she still wanted to go sledding when she got home. "Really, I'll get your sled out. Are you sure?" She rolled her eyes at me. In the funniest, cutest way possible, of course), and by late afternoon the second day the sun finally peeked out and the temperature rose to a whopping 12, so I let the girls go outside to play. I will confess, I had one or two moments in which I questioned my ability to keep the three girls constructively occupied and fend off as much whining and fighting as possible. I may have ended up on the basement stairs, in a self inflicted time out, for about five minutes at the end of day one while the girls hollered my name from above. "Mom, Mom. Mom!! Can we have more snacks? Where is the glitter? I ran out of toilet paper. Aubrey is eating a magazine. Aubrey just pulled all of your laundry onto the floor. Can we watch a movie. Will you play a game with us? Can we do jumping jacks off the couch? Did you get our snow pants and gloves and boots and socks and hats out yet? Did you get the hot chocolate ready for when we come in? When can we have something to eat...again. Aubrey wants to be nursed AND her diaper needs to be changed. Mom? MOOOMMM? WHERE ARE YOU?" A momma's got to take a deep breath at some point, right?! I finally answered and we got back to business as usual. 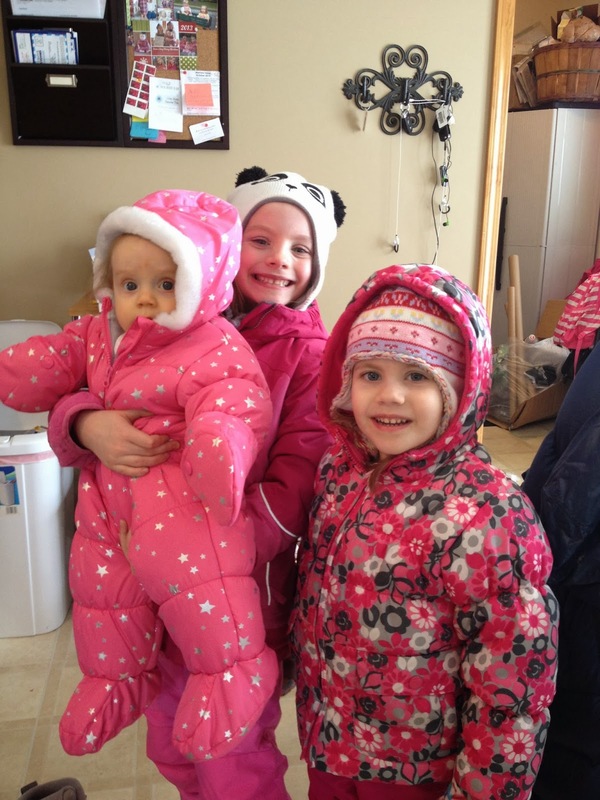 All bundled up for our "snow drive". I got in trouble (in the nicest way) after I posted our outing on Facebook. Apparently there was a driving ban in our town. 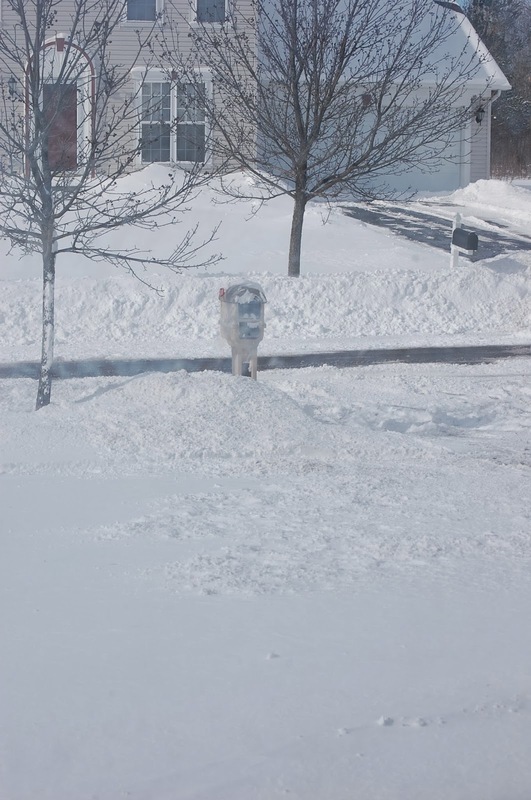 Lesson learned...turn news on at least once during the day during a blizzard in Buffalo. 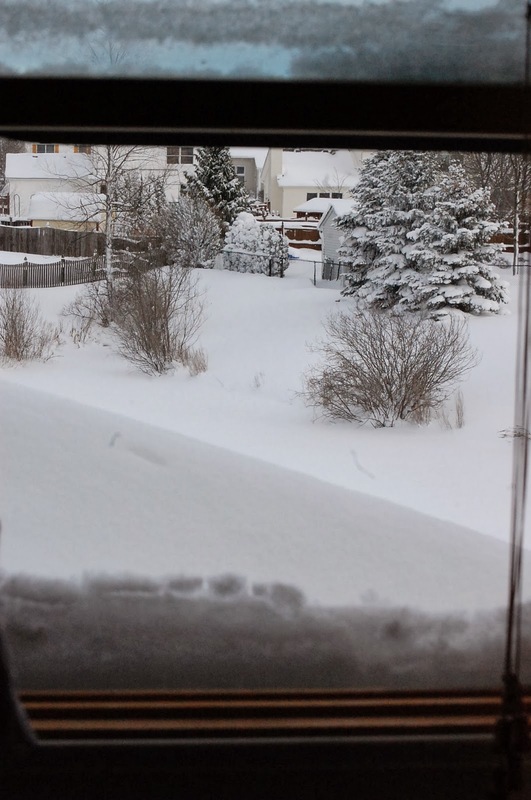 The snow outside our back window. Day two...when it had finally "warmed" up. When in Buffalo, do as Buffalonians do. Well, the kids anyway. Eat snow! Aubrey wanted to join the girls! And became very confident in her pulling up abilities. 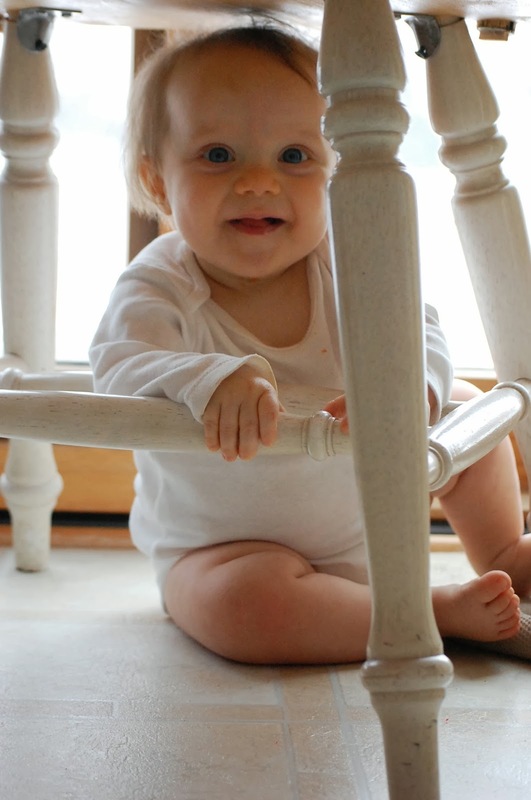 And sneaking underneath kitchen chairs. And discovering she knows how to open cabinets. 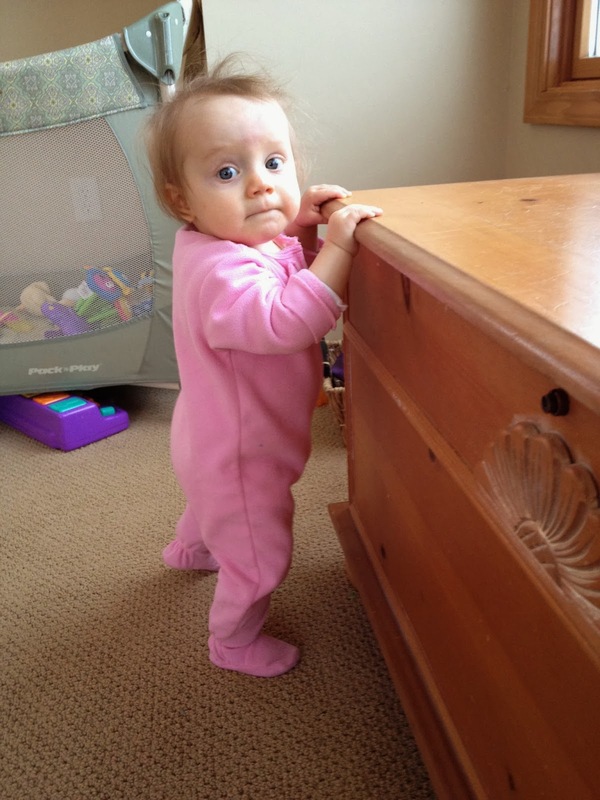 Yes, yes...Let the games...and baby proofing, begin! The obligatory, and very yummy, post snow, hot cocoa. Views from my bedroom window. We had fun while it lasted, but now we are actually praying that we don't have anymore snow days because we have reached the three included in the school calendar...one more means a make-up day at the end of the year! I bought this book last year in hopes that it would give me the answers to all of my biggest problems…well, all of the ones that stem from a perpetually disorganized house, purse, bedroom, car…ahem, life. I try to be organized, really I do. I sorted my junk drawers like it was nobodies business right before Aubrey was born…I've got sorters and baskets and labels and file folders. I told Scott the other day, "If I could just have the house to myself for two weeks, I could get EVERYTHING in order and then ya'll can come back and live here again." He laughed. We won't speculate on why. So anyways…I really did used to be, well, kind of organized. I can't lie and say I was perpetually type A, always tidy and orderly. My sister and I used to share a bedroom and I know she's reading this. 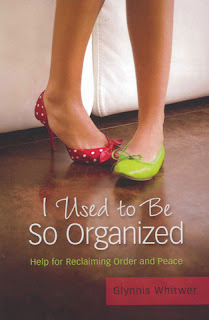 We used to have epic fights over my "organization" methods (neat, orderly piles ALL over the bedroom) vs. hers (throwing my "piles" out or jamming them in the closet or under the bed, which I thought was VERY impractical. How are you supposed to find what you are looking for if you can't see it?!). We'll just say her house looks like our bedroom after she used to clean it, and my house looks like our bedroom…well, all of the other times. You can see how that book might help me. I'm hoping to read the rest of it this year…as soon as I find it. 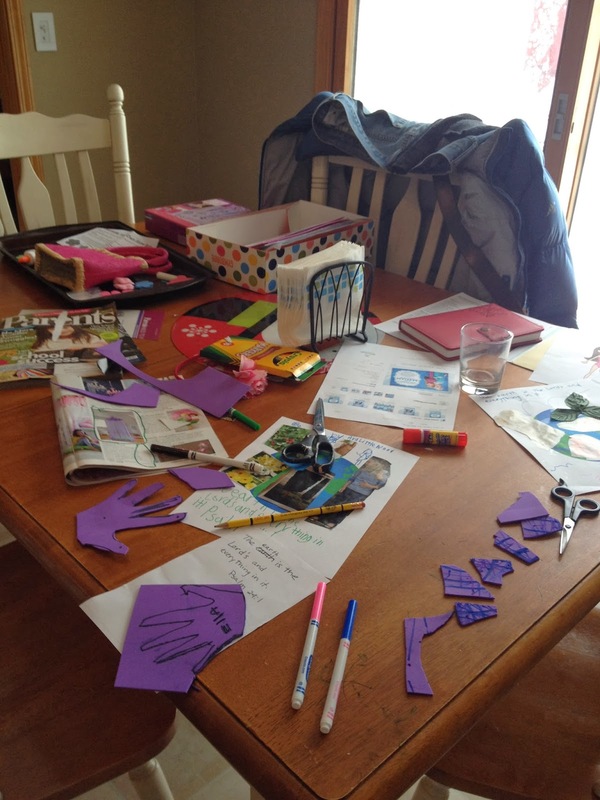 All this to say…I used to be organized (sort of…in my own sort of way) and then I had kids. And once we became parents to 3 things really got hairy. You should see our mudroom…We can't have any more children because we have reached maximum capacity on shoes and coats and hats and glove storage. Tonight was the epitome of all things hairy and crazy in my neck of the woods. So much so that I was convinced at one point that I was either being followed and recorded for a parenting blooper show or I had entered the Twilight Zone. It all started as we were walking out the door to go to gymnastics. I sent the girls out to the car as I put my boots on, said goodbye to the baby, and looked around quickly for my cell phone. "Ava's boot hit me in the face." "Mom, it was an accident", she attempts to scream over the crying to fend off my irate reaction. "Seriously? Ava, how does a boot accidentally hit someone in the face?" "I tripped and my boot slipped (evidently as she was climbing into the car) and Ella was right there…"
"Ella, you're ok. Ava hold your sister's hand and gently walk her out to the car." As soon as the girls are outside I ask Scott if he has seen my phone. He hasn't, but decides to call it. We both listen carefully for the ring. It sounds muffled, like it's coming from the inside of a plastic bag. He puts his ear up to the garbage can as I watch in disbelief. He doesn't even respond. He simply send an I-phone alert from his phone to my phone so that my phone will ding until I find it. He picks up our white, plastic garbage can and walks across the kitchen listening to it. He abruptly starts dumping the trash can into our kitchen sink. The ding is getting louder as the trash pile gets higher. Finally, deep beneath a pile of orange peels and scrap paper and tissues my phone emerges. "Wow," Scott says as he stares at me. "It wasn't me, I swear." I say. He shakes his head…not because he is upset with me, just because our lives seem THIS nutty every day lately. Anyhew…I must get going, so I grab my trashy phone and head out the door. Gymnastics is fine and everyone is in a great mood until we get out of the car to re-enter the house. Ava, who was being helpful and carrying a bag of groceries slips in our garage because of the snow on her boots and the floor and starts crying hysterically, the neighbor girl who has been itching to see our girls for weeks walks up behind me, Scott answers the door in his boxers as I holler for him to help Ava because my hands are full with the other groceries and Ella is right behind me. "Mr. Scott, why are you in your underwear?" she asks. It's an honest question…just not one we even have time to answer at the moment. "Hey hun, I'm sorry…the baby is crying (she was! 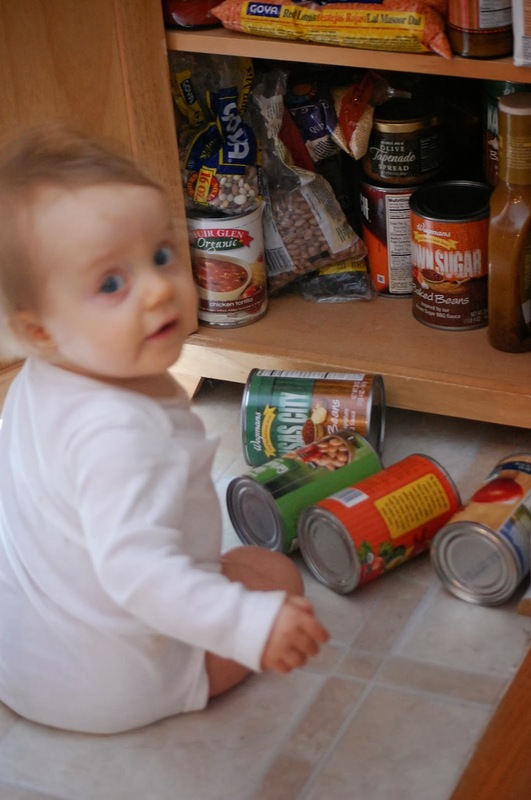 ), Ava is crying and we need to eat dinner…"
Somehow we all sit down to eat the soup which Ella and I threw in the crockpot earlier that day. Corckpot Zuppa Toscana. It sounded good. In theory. "If you don't like it, make a peanut butter sandwich." She gets up to make one. I taste the soup. I think I want a peanut butter sandwich. Why I thought 1% milk would a good substitute for heavy cream in a soup recipe I'm not sure. I'm going to go on record here to say…It's NOT! We finish dinner and baths. I read a couple of stories to the girls and then grab a bag of returns that are intended for the mall. I have three pairs of pants that need to be exchanged at Gymboree and am planning to run into New York and Company to grab a pair of velour sweatpants to replace the large maternity pair I've been wearing for too many months and which were actually purchased during my first pregnancy with Ava. Of course, as I'm walking out the door I can't find my wallet…the wallet that somehow got misplaced when I walked in the door from gymnastics (you see, I don't intend to be disorganized, things are just often hectic when I walk through the door when I intended to put my wallet in a safe place!). I spend 5 minutes looking for my wallet, eventually deciding that since I'm just doing an exchange I'll grab my credit card before it gets too late. I drive in blustery snow and 7 degree weather to the mall at 8:35 p.m. I get into Gymboree, find a new pair of jeans for Ava, put the other two pairs of pants up on the counter (that I do not have receipts for). The nice lady rings me up. "I just need your license to run this without a receipt." No. My license? The one in my wallet? The wallet I don't have? I blush so much I can feel my face get hot as I tell her that not only do I not have my receipts, or the original credit card (we had to shut it down due to a recent fraud issue) that I don't have my license either. All I have is the credit card my husband handed me on the way out the door when I told him I could't find my wallet. She says she's sorry and can hold the jeans, but can't do anything without scanning my license. I tell her it is my New Years Resolution to be more organized. She sweetly tells me she gets it. She said she tells herself that every day. I'm ready to wave the white flag. As we're finishing up two evidently stoned teenagers come waltzing into the store with their hats on backwards and their pants hanging low (I'm not kidding). They proceed to ooh and ahh at the clothing in a very dramatic way and tell the two middle aged women how nice their store is and ask them if they sell baby clothes. Michael Jordan baby clothes. This is where I begin to wonder seriously if I've entered the Twilight Zone. They leave. I say goodbye and apologize and say I'll be back. I go to New York & Company for a pair of sweat pants. A stay at home momma deserves a pair of sweatpants that fit, right? They have none…absolutely none…in my size. A rack of 25+ pairs and not one in my size. Wait, I take that back. They had one pair of small petite pants. They were fuchsia. A bright pink fuchsia color. As much as I would love a new pair of comfy, stay at home sweat pants I can't bring myself to buy fuchsia velour sweatpants. Although at this rate it seems like a fitting addition to my nonsensical life and I pause to consider it momentarily. Boo. No wallet. No exchange. No new sweatpants. As I'm leaving the mall I notice two young guys at a kiosk and desperately try to avoid eye contact. I have no idea what they are selling, but I am sure I do not want it. "Hey there I have to ask you a question!" I try to swerve and pretend I don't see him. The admittedly gay, Brazilian hair stylist from Florida wants to know how I style my hair. Style? What's a style. This frizzy mess that I blow dried after the first shower I had taken in five days yesterday. Next thing you know he has me sitting in a chair and is giving me a song and dance about metal hair straighteners and how they fry your hair. "You know that burning smell…" he says in his brazillian accent. "Yes…dat….dat is your hair burning. Let me show you dis." He asks me my name. "It's actually Lisa, but I kind of like Melisa." "Ok. I call you Melisa." For the next five minutes he tries to sell me a $300 hair straighter while accentuating his sales pitch with the addition of "You know what I mean Melisa?" after every sentence. I can't help but laugh and after the night I've had I figure what the heck. I might as well let this gay Brazilian hairstylist from tampa straighten my hair and put some very nice product in it (product he claims is $100!). Guess what….when I won't budge…he says I can get two hair straighteners for the price of one and give one to my sister…He's got me holding a blue one and a pink one in my lamp now. I finally get up and tell him I have to go. I have three kids to get home to. I walk away and attempt to call Scott to commiserate. I look down and my phone dies right in front of me. As I walk out of the mall and back to my car in the cold I wonder how I've ended up here. Here in very cold Buffalo. Here at this stage of my life. Here on this night with my missing wallet and some dude trying to sell me a $300 hair straightener ( I actually wanted to tell him that if I had $300 to spend I'd buy a Vitamix long before his hair straighter, but I figured he wouldn't get it so I kept it to myself). Here in my messy house with no time in sight to clean and organize. It's a good and blessed life. I can certainly find my thousand gifts…I know I can. But it all feels a little silly sometimes. I come home and eat a pack of bat shaped pretzels leftover from Halloween. The salt tastes good. Even though I think it's time that this day come to a close and I should crawl into bed with a book I decide to write a blog post, because I want to laugh at this someday. I also figured that if I wrote about it it would feel a little less like that day owned me and a little more like I owned it…or at least my reaction to it all. And so instead of a tidy summary of my New Years Resolutions I'm leaving you with my messy New Years reality television kind of day. Hope you got a chuckle from it all. p.s. when I find my wallet I promise to let you know where it is and when I find that book and finish it I promise to let you know if it helps!